There are few things more satisfying than sharing a good book with someone. I would rank “sharing a book” above “my mother-in-law’s chocolate bread pudding,” and trust me, that is saying something. One of my favorite book sharing memories comes from when I was just out of college, trying to figure out how transition from college friend to adult friend. My friend Judy and I had a very grown up, meet your friend for lunch get together, but we needed something more. At that time there was a wonderful independent book seller on Main Street in Newark, Delaware, and Judy and I stopped in to browse together after lunch. We each decided to buy a book – for the other person. I cannot remember what book I bought Judy. I hope it was a good title. Judy bought me The Handmaid’s Tale by Margaret Atwood, which rocked my world and changed me, and has been on my list of favorite books ever since. I also love sharing books with my kids. When they were small, I read to them favorites from my childhood, like The House with a Clock in its Walls by John Bellairs, Harriet the Spy by Louise Fitzhugh, and The Hobbit by J.R.R. Tolkien. It’s thrilling when they love the books I have chosen, and even if they don’t love my choice, I learn something about them and their personalities. When I get a book recommendation from my kids, I always give it a try – I know if they want me to read a book, they are sharing a private world and inviting me in to take a look. That’s important. My strongest book sharing relationship is with my friend Julie. For the past 10 years, we have passed books back and forth, and we have developed a code for our book sharing. If Julie tells me she doesn’t want the book back, I know it’s a good book, but not a great book. If I tell Julie that she needs to give the book back when she’s done so my husband can read it too, she knows it’s a fast paced, exciting book. And if we hand a book over to share and it’s a library book with a week left on its checkout, it must be an amazing book that is too good to wait for the library bureaucracy to process. Read it NOW. I was in England in the spring of 2011 when I first heard about World Book Night, reading a poster in a W.H. Smith’s. Amazing! A night devoted to sharing books, especially with people who might not be enthusiastic readers. And then in 2012, World Book Night was introduced to the United States. Last year, I was a book giver for World Book Night, and the title I gave out was The Hunger Games by Suzanne Collins. I picked The Hunger Games as my first choice, because I felt it was a title that crossed genres – young adult, fantasy, girl heroine, science fiction – and could appeal to many readers, particularly people who don’t choose to read very often. The editions given away on World Book Night were printed for the occasion, and were donated by the publishers and authors. 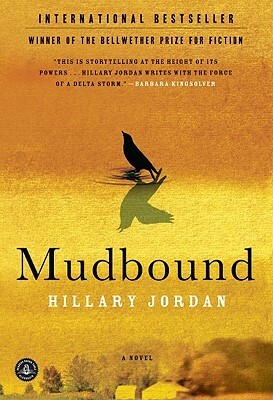 I applied again this year to give away books, and this year I will be giving away Mudbound by Hillary Jordan. I have not read this book yet, and it feels strange to give away a book that I don’t have a personal connection to yet. Mudbound won the Bellwether Prize, awarded to unpublished manuscripts that support social responsibility, which is the reason this book was my first choice to give away. This year, as I did last year, I will be giving my books to the residents and staff of Epiphany House in Wilmington, Delaware, part of the ministries of Friendship House. Friendship House does amazing work for the homeless in my hometown. I hope that having a good book to read will make a difference to the women of Epiphany House. Sometimes having a good book to read can make all the difference in the world.